"iLevel allows me to participate in eye-to-eye conversations and to walk with family and friends as an equal participant." Instead of feeling confined to his wheelchair, Jim feels liberated because he is able to do things with his family. For some, a power wheelchair offers many exciting possibilities for a life of mobility. For Jim, it was a feeling of liberation. With late onset multiple sclerosis making mobility a challenge for him, Jim obtained a Q6 Edge® 2.0 Power Chair with iLevel®. “Rather than feeling confined to a wheelchair, my Q6 Edge 2.0 liberates me to do the important things in my life,” Jim said. 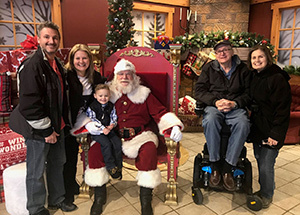 With his power chair, Jim plays an active role in the lives of his grandchildren, attending their musical concerts. He joins family outings at restaurants and shopping malls. He also takes walks through the woods with his wife. “iLevel allows me to participate in eye-to-eye conversations and to walk with family and friends as an equal participant,” Jim said. Jim responds to the progression of his MS with a positive attitude, which he attributes to the support he receives from his wife and family.